Theileria orientalis is an apicomplexan protozoan blood disease of cattle spread by H.longicornis that has been present in Australia since early 1900s and was traditionally regarded as relatively benign. In the early 2000s, clinical disease outbreaks in cattle due to T.orientalis began to appear in eastern Australia and three Types of T.orientalis have become recognised based on major piroplasm surface protein (MPSP), namely Chitose, Ikeda and Buffeli (Eamens et al 2013), with Ikeda being the most pathogenic, and Chitose less so; it appears that Buffeli was the only Type present previously and it still appears to be of low pathogenicity. This poses the question as to when and how the more pathogenic Types came into Australia and spread; probably with imported live adult cattle in the late 1990s. In Japan and some other countries, this pathogen is also known as T.sergenti. This case note has focused on the significance of pregnant cow mortality in two neighbouring properties, and we discuss the movement of Theileria-naïve cattle to endemic regions. The District Veterinarian of Greater Sydney Local Land Services (formerly LHPA) investigated mortality events in two adjacent properties in western Sydney in different years. Property 1: In August-September 2013, 21 cattle died over a period of four weeks out of a herd of 150 pregnant cows (14% mortality rate) moved from Central Tablelands NSW in June of same year. Pasture condition was good and annual vaccination with 5–in-1 was up to date. Property 2: In July-August 2016, 14 pregnant cows died on a 2500 Ha property (divided into 4 paddocks) in the Western Sydney area. The herd comprised 280 cows (5% mortality rate) of which approximately 180 were pregnant. These cattle had been brought onto this farm from near Goulburn NSW in April same year. They had no previous history of illness, but poor pasture conditions lead to them being moved to the current property. Their annual vaccination with 5-in-1 was up-to-date, and they had been drenched with ivermectin in late July 2016. In the days following mustering for routine procedures (e.g. vaccination and drenching) there was a significant spike in mortality that slowly dropped over the next four weeks. Property 1: During the investigation, 6 cows appeared to be lethargic and were found to be severely anaemic. The worst affected cow when examined was found to be pyretic (temperatures 40°), perhaps influenced by recent mustering. EDTA and lithium heparin bloods were obtained and sent to EMAI. Property 2: The herd of cattle was observed and examined in the paddock. About 5% of the animals were in low body condition (score ~1.5 in the scale of 0-5) and showed signs of lethargy and inappetence. A severely affected cow showing weakness and incoordination was selected, and EDTA and lithium heparin bloods were obtained and sent to EMAI. Diseases to be considered were theileriosis, tick fever, nitrate-nitrite poisoning and copper toxicity or deficiency. Except for theileriosis, the other suspected diseases were excluded on the basis of clinical history, clinical signs and/or laboratory test results. To prevent further risk of mortality due to induced exercise from mustering (as theileriosis was in the differential diagnosis list) minimum numbers of animals were selected for physical examination and blood sample collection. Although the mortality events were in different years, the properties were adjacent to bush land. In both investigations, blood sample from individual cows had ~10% theileriad-parasitaemia and Packed Cell Volume (PCV) of ~10% (compared to normal of 23-44%). 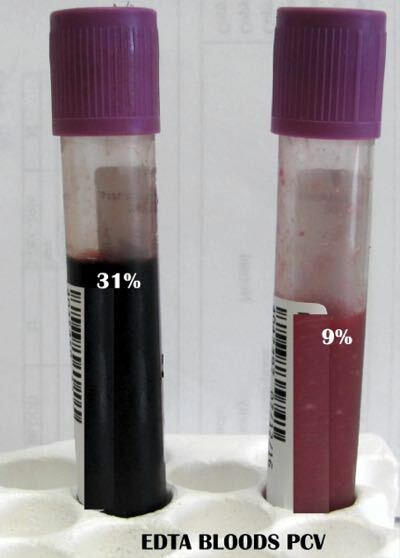 Figure 2: Examples of EDTA bloods from jugular veins with differing pack cell volumes: 9% being severely anaemic. Figure 3: blood smear from Cow, property#1 (~10% theileriad-parasitaemia) stained with DiffQuik, showing intra-erythrocytic theileriad piroplasms x1000. The microbiological disease diagnosis and research (MDDR) laboratory at EMAI used PCR on EDTA-blood and confirmed the presence of the Ikeda and Chitose Type T.orientalis, but not Buffeli. The load of Theileria detected by qPCR in the blood sample was 724,629 gene copies. It has been shown that if the gene copy number is above 300,000, 95% of individuals show clinical signs of theileriosis such as severe anaemia (Note from pathologist in Laboratory result). Mortality was probably due to anaemia as a consequence of pathogenic theileriosis compounded or accentuated by imposed stress of mustering in the late pregnancy. Australia has more than 70 different species of ticks infesting various animals, including cattle. Haemophysalis longicornis or the ‘bush tick’, was probably introduced into north coastal NSW from Japan or a neighbouring country in early 1900s (earlier descriptions refer to this parasite as H.bispinosa) and then it spread though south-eastern Australia; in 1983 it was recorded in restricted areas of WA. H.longicornis is a three-host tick that feeds on the blood of one host, falls off, moults and then re-attaches to feed on a new host. This tick can also affect a wide variety of other host species including dogs, humans, horses, wild birds etc. 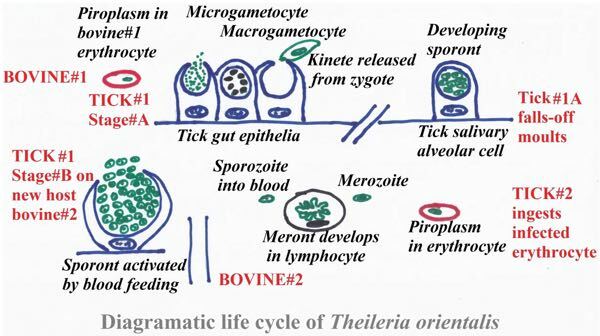 Transmission of Theileria is from one stage of the tick life cycle to the next, i.e. trans-stadial, but not trans-ovarian. Thus a larval (instar) stage, or nymph tick becomes infected by ingesting erythrocytes containing theileria piroplasms from an infected bovine; these invade digestive cells in the tick’s gut and develop into microgamonts and macrogamonts. The fertilised zygote releases a single motile kinete which migrates to the salivary gland and develops into a sporoblast and the sporozoites multiply abundantly when the next stage tick (nymph or adult) commences a blood-feed. The sporozoites are then transferred into the next bovine host’s circulation. The sporozoites in the bovine host multiply in lymphocytes as merozoites and the released meronts then infect erythrocytes, develop into piroplasms and thus can initiate another round of potential tick infection. 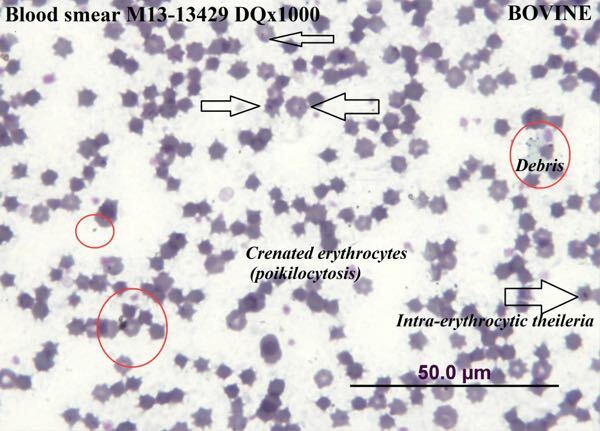 Erythrocytes infected with piroplasms probably undergo an IgG-immune-mediated phagocytolysis leading to anaemia (Shiono et al 2004). The prevalence of clinical theileriosis infections in cattle varies according to season with a higher prevalence in warmer months, and both these cases occurred in spring. This is probably related to activity of the tick host. Field investigations have shown that clinical theileriosis outbreaks in east-coastal regions of Australia are most commonly observed following movement of cattle from non-endemic to endemic areas during the spring or summer. Pregnant cows seem to be particularly susceptible to clinical disease and may abort or develop anaemia during late gestation through to two to four months after calving. Cattle raised in endemic areas generally develop immunity to clinical theileriosis whilst remaining sub-clinically infected for life. Cattle moved from non-endemic to endemic areas often experience disease during the first tick season and subsequently develop immunity. However, infection with Buffeli does not seem to provide protection against the more pathogenic Ikeda or Chitose Types. Antibody ELISA for sera is available (in 2016, $90 for a single test, reduced price for batches), and tends to be positive in cattle that have recovered from clinical disease, but it cannot determine Type and has limited application for selection of cattle that may be less susceptible to clinical theileriosis. The multiplex PCR on EDTA bloods is more sensitive, reliable and robust than examination of stained blood smears, and can determine Type (2016, $50 per PCR). Therefore, PCR testing could be a useful indicator of greater resistance to potential clinical disease i.e. only source cattle that have been infected with Ikeda and Chitose. However, this would introduce pathogenic Types onto that property. These field investigations show that clinical theileriosis can cause significant mortality in cattle. It is suggested that prospective cattle should be tested for exposure and thus some immunity, prior to movement into known endemic regions where pathogenic Types of T.orientalis are known or suspected to occur. Remember, there is no current effective treatment for clinical theileriosis of cattle in Australia.